During spring 1999 series of earthquakes stroke Sulaimani City of about 2-4.5 degrees and according to Aziz et al (2000). They added that these earthquakes were resulted from two strike slip faults that are located in the west of Sulaimai city and intersect under the city. According to these authors, the epicenters were located about 5-11km to the northeast of Sulaimani city (Fig.1). Another series of earthquakes were stroke city again during 21-23 January, 2011 with about 3.3 degrees. According to Directorate of Sulaimani Seismic Station, the epicenters were located 6km to the northeast of the city (nearly same place as that of 1999). Most of the people of the Sulaimani city had felt the two series of the earthquakes but no causality or damage had been recorded. The aim of this study is to update the risk of the earthquake and geology of the area around Sulaimani city into which the urbanization expanding rapidly now especially toward northeast and northeast. 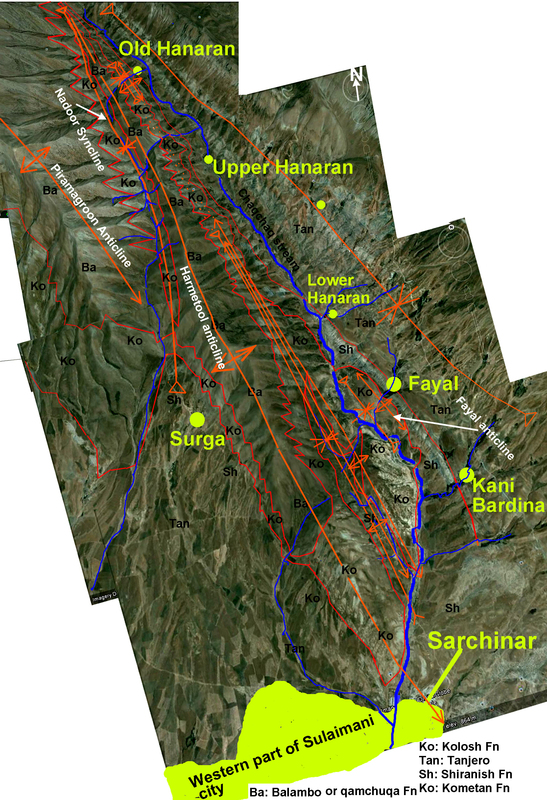 Aziz et al (1999) concluded that the probable cause of the 1999 earthquakes was related to rejuvenation of the Sulaimani-Sitak fault that intersects with Chaqchaq strike slip fault beneath Sulaimani city (Fig.1). 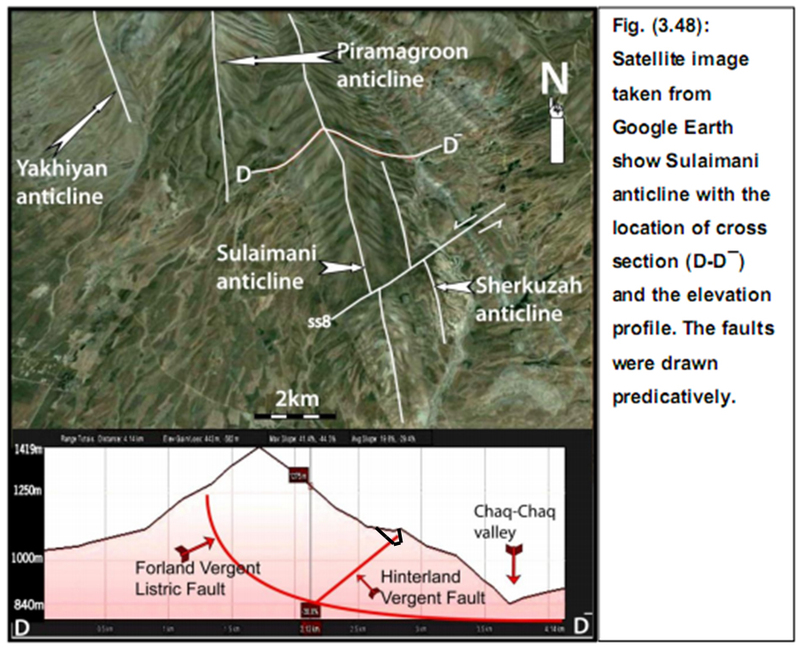 Sulaimani Anticline (Ma,ala, 2008) (Harmetool anticline in the present study) is recently mapped by Al-Hakari, (2011) and found two other strike slip faults in the area to the west of the Sulaimani-Sitak fault (Fig.2 and 3 ) . Fieldwork (by present author) in the area of these four faults (at the west and northwest of the Sulaimani city) has not found evidence for occurrence of them. The geological mapping of the area showed no shifting (opposite movement) of the structures (axes of anticlines and synclines) and stratigraphic units (formations) of the area (Fig.4). The negative result of the fieldwork at west and northwest of Sulaimani city diverted the attention to the northeast of the city. In this area Karim (2005) found a major breakage (a normal fault) nearly in the same area where the epicenter of the earthquakes has happen (northeast of the city) (Fig.5). 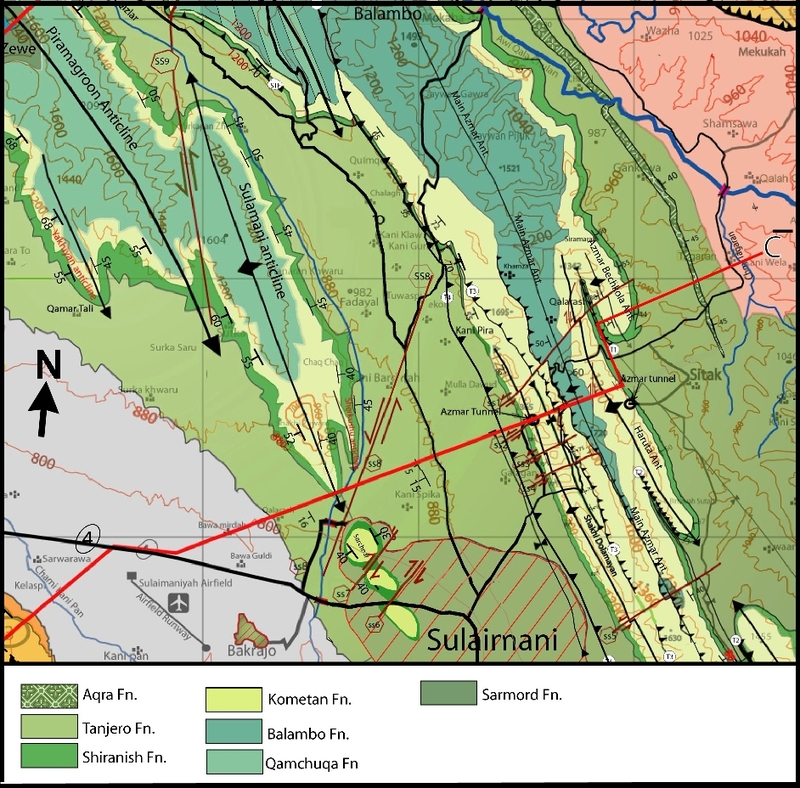 It is most probable that Sulamani earthquakes are attributed to this normal fault. Fig. (1) Geological map of the west and northwest of the Sulaimani city (Aziz et al, 1999) according to these authors, the 1999 earthquakes of the city is attributed to two strike slip faults that shown in this map that found by them. Fig. 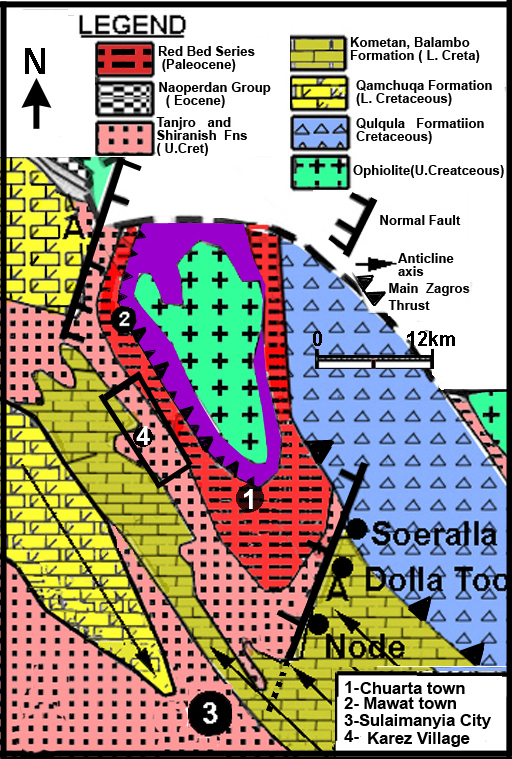 (2) Geological map of the area to the north and northwest of Sulaimani city ( Sissakian, 2000 ; Maala, 2008 and modified by Al-Hakari, 2011) showing the strike slip faults that found by the latter author. Fig. (5) A normal fault at the northeast of Sulaimani city (Karim, 2005) along the villages Sueralla,Dolla Too and Node villages. The two series of earthquake of the Sulaimani city is most probably related to this fault. There are two evidence that may prove that the earthquakes are related to the normal fault that recorded by Karim (2005). 1- During 1999 earthquakes have occurred in the same area (at several km to the northeast of Sulaimani city, around Citak, Weladar and Alla Syiau villages (Aziz et al, 1999). 2-The earthquakes are local and weak therefore, it may have no relation to the plate tectonic but it generated by the normal fault. Aziz , B. K. , Lawa, F. A., and Said B.M. 2001. Sulaimani Seismic Swarm during spring 1999, NE Iraq. Journal of Zankoy Sulaimany.Vol.4, No.1.pp87-100. 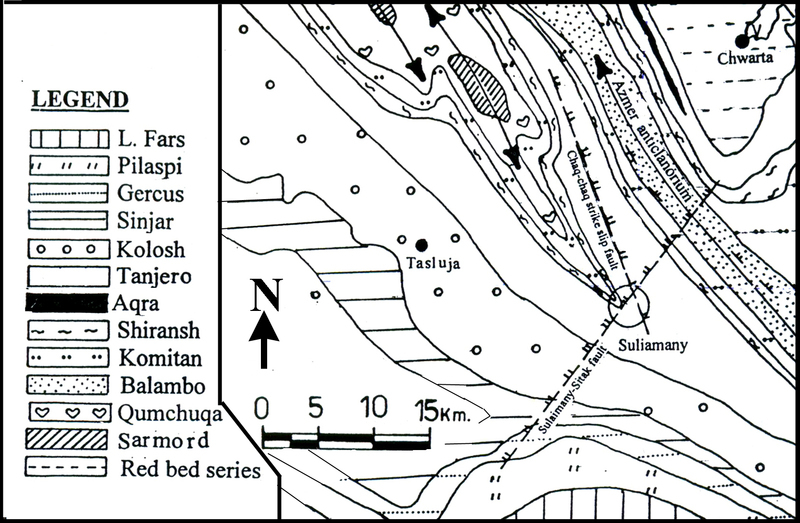 Karim, K. H. (2005)Some sedimentary and structural evidence of possible graben in Chuarta-Mawat area, Sulaimanyia area, NE-Iraq. Iraqi Jour. Earth Sci., Vol. 5, No.2, pp.9-18. Ma,ala K.A, 2008.geological map of the Sulaimaniyah Quadrangle, sheet N1-38-3, scale 1:20000, GEOSURV. .
Sissakian, V., K., 2000. Geological map of Iraq, sheet No.1- 3-307 rd edition, Geol. Surv. Min., Invest., Baghdad, Iraq.